Quick and simple project to spice up your office! 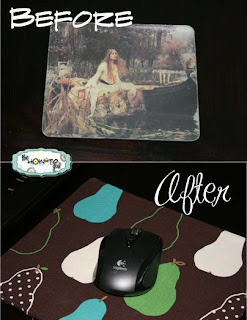 I took my "Lady of Shalott" mouse pad (which I loved three years ago) and gave it a face lift to match my taste today. You may recognize my fabric...can't get enough of it. Time spent? 10 minutes TOPS. I cut my fabric larger because it frays at the edges and I needed enough to glue over the edge. 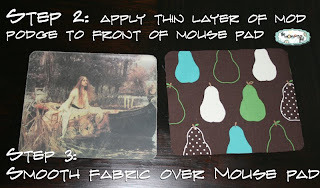 If your fabric doesn't fray at the edges then don't worry about cutting it bigger. Step three is important. Make sure there are no bubbles. Helpful hint: I placed the fabric down and then smoothed from the middle out to prevent any puckering. Finally, if your fabric frays like mine, glue the edges over the sides. P.S. Tick Tock...only 30 more hours until the GIVEAWAY ends! Make sure you enter and leave a different comment for each qualification you complete. This is GREAT! I was totally just looking at my ugly black mouse pad at work which has "verizon" on it...and I thought, "I wonder if I can switch somebody." Naw..i can COVER it! You are brilliant! 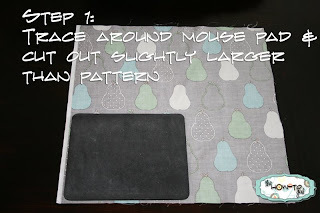 glad to see you are getting so much good use out of that pear fabric! love ya!